The new EU Cohesion Policy is one of the largest integrated development policies in the Western world, and one of the largest of such programmes anywhere in the world. The reforms to the EU Cohesion Policy contain many different elements each of which interlink in order to provide a cohesive overall framework. Some of the key elements in the reforms, however, relate to the conditionalities employed and their effects on policy governance and the control mechanism, the smart specialization approach to policy prioritization and resource allocation, the underlying place-based logic of the policy, and the overall results orientation and evaluation emphasis of the policy. 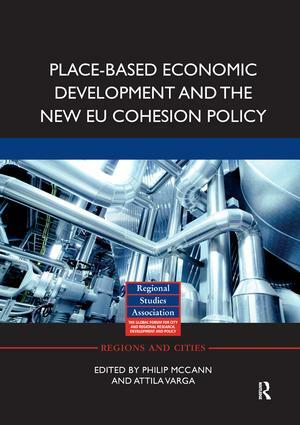 In each of the areas of the EU Cohesion Policy reforms, many different scholars from the fields of regional studies, regional science and economic geography have played important roles in shaping the new policy, and the chapters here highlight these increasing interactions between the policy and academic spheres of debate. The collection of essays in this book each deal with specific aspects of these critical elements of the Cohesion Policy reforms. In particular, they examine some of the strengths and weaknesses of these individual elements and allowing for a better understanding of the origins and backgrounds of many of the ideas underpinning these reforms. This book was previously published as a special issue of Regional Studies. 5. When Spatial Equilibrium Fails: Is Place-Based Policy Second Best? Philip McCann holds The University of Groningen Endowed Chair of Economic Geography in the Faculty of Spatial Sciences at the University of Groningen, The Netherlands, and is also the Tagliaferri Research Fellow in the Department of Land Economy at the University of Cambridge 2015-2018. He is one of the world’s most highly cited and widely published economic geographers and spatial economists of his generation. Attila Varga is Professor and Director of the Regional Innovation and Entrepreneurship Research Centre at the University of Pécs. He is an internationally well-known researcher of the field of regional innovation and economic development. He publishes widely and serves on the editorial boards of various international journals.